Well here we are, a brand new month and the first one that marks the start of a new season. I know many of us are ready for chili cook-offs, pumpkin pie, and comfort meals; however, the first few weeks of September always pose a little snag when it comes to meal making. The mood is all set for fall but the temperatures don’t exactly match it quite yet. You may not be ready to pull out the deep-dish casserole pan just yet but the idea of grilling another piece of chicken is starting to sound dull. So where does that leave you around dinnertime? I’ve always found an easy solution in the pre-fall menu to be stir-fries. It’s one of those dishes that can be enjoyed year round, still using the essence of summer produce that you may have on hand. This Quinoa Pineapple Fried Rice is a fantastic weeknight meal option and can easily incorporate whatever vegetables are left from the garden. I like to add a protein source such as chicken or shrimp, to really bulk up the nutritional value but you can certainly leave it all veggie friendly. Before your cooking desire fizzles with the end of the season, try this quick, easy and delicious homemade takeout meal that comes together in minutes. Heat a large skillet. Add the veggies and garlic, season with salt and pepper and cook for 5 minutes. 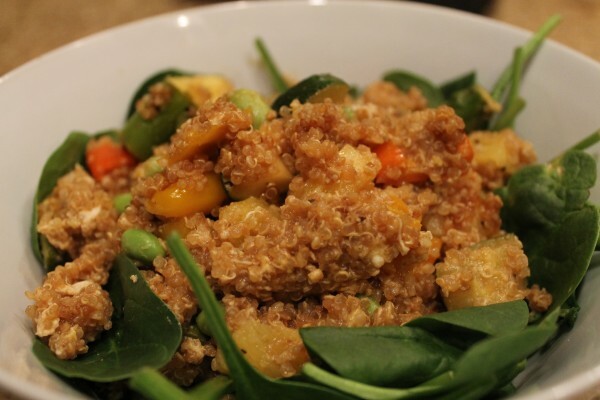 Add the cooked quinoa and let it brown in the pan for an additional 3-4 minutes. Add the soy and mirin sauces and mix well. Add pineapple and mung beans and stir. Make a large hole in the middle of the mixture and crack the eggs into the center. Let the eggs set for a minute or two and mix all together. 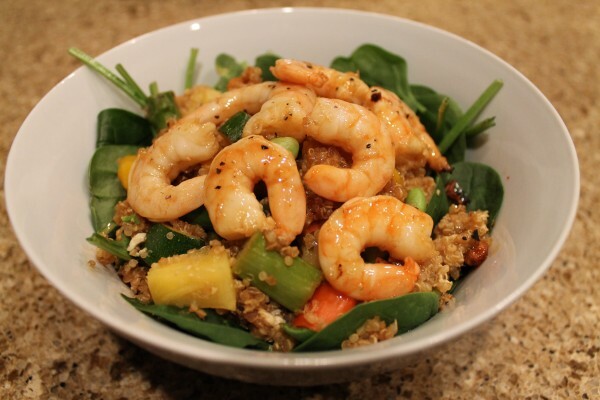 Optional: You can certainly eat this on its own or you can add another protein such as shrimp or chicken.